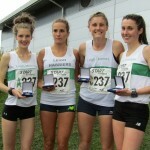 Leigh Harriers Senior Ladies road relay team won the teams second Northern medal of the year, winning the Northern 4 stage road relay title at Sports City on Saturday bettering the bronze medals the team won at Blackpool in the six stage relays in March. The Northern four stage relays took place at Sports City on Saturday and attracted eighty three of the best ladies teams in the North of England; the race was 4 stages of 6k starting and finishing on Sports City’s track and covering two laps of the road around the Etihad Stadium. Olivia Stones – the youngest member of the team – took up the challenge of the first leg running a very competitive race giving the team 12th place in a time of 21:37; Abigail Howarth quickly improved the Harriers team position with the 4th fastest time of the day of 20:42 putting Leigh in a medal position in 3rd place. Laura Riches was soon challenging for the lead running the fastest of all the runners on leg 3, she handed over to Lauren Howarth on the final leg with a slender lead of 18 seconds, Lauren, Leigh Harriers premier distance runner was soon picking up the pace increasing the teams lead with every stride bringing the team home in first place with the days fastest leg of 19:47 – and a 1:20 lead for the team. This is the first time the team have won the gold medal in the 4 stage relays having won silver and Bronze in previous years and showed outstanding running from all the team . The Senior Men’s team competed in the 6 stage road relay – six legs of 6k. One hundred and twenty teams contested the championships and Will Rawson took the challenge of the first leg running well against some of the best athletes in the North of England. Will finished in 29th place in 20:32 handing over to Neil Pendlebury who improved the teams’ position to 23rd on the second leg in a time of 20:57. Tom Kneller running the third leg ran a time of 22:42 handed over in 28th place, Tommy Henders maintained the team position running 22:52 for 30th place. John Indrickes running the 5th leg recorded a time 25:31 for 47th place with John Howarth running the final leg in 25:27 giving the team a final position of 53rd , a solid performance from all.